Recently we posted suggestions for Approaching Potential Presenters, now we provide some suggestions for confirming presenters. The most important aspect of confirming presenters is to reply promptly to them confirming you received their confirmation, even if they themselves have taken days, weeks or even months to respond to your initial invitation. All too often I’ve seen groups miss out on quality presenters because the group were too slow to re-confirm the booking. Yes, the presenter may have taken for ever to respond, but remember YOU were probably the one that asked THEM to present and your group’s meeting was most likely not the highest priority for them. But they should now be your highest priority – after all they are giving up their time to present to your group. When replying and confirming the booking it is always wise to restate as much of the information the presenter may need – I work on the assumption they do not have the original email(s) handy and it is better to resend the same information twice, then for them not to get it at all. Also, never assume that the presenter will remember the date they agree to present on. Nor should you rely on your standard “Meeting Reminder” messages that you send your members and other interested parties to act as a reminder to them. By all means send them the standard message, but be sure to send specific and custom messages to them that only focus on reminding them about the presentation date, venue. The initial confirmation can just be a simple reply to their message, but it should re-state the date and time and let them know that you’ll be back in contact prior to the presentation to re-confirm details. Thanks for agreeing to present the Apple Pie Maker to AuAUG on Tuesday, September 24, 2010 at 7:30pm. You have the first presentation slot of the evening and the second presentation will be “Making Greeting Cards in Pages” which will be presented by David Jones, one of our members. We’ve listed the title of your presentation on our website under the Forthcoming Presentations. If you’d like to supply a couple of sentences describing the topic, we can add these to the website too. A corporate logo or product icon can also be included if you supply us with one. If you have any further queries, please do not hesitate to contact me via email (present@auaug.com.au) or telephone me on (02) 9988 7766. Otherwise, I’ll be contact with you again closer to the presentation. If your group is highly organised and has a presentation schedule planned out more than three months ahead (which to be honest, every group should try to achieve) then one week prior to the meeting before the presenter is scheduled to present (aka approx 5 weeks before their presentation), send them an invite to attend that meeting as your guest and as a visitor. This gives them an opportunity to check out your groups facilities and make arrangements for anything they may require. It also gives them an opportunity to test timings on getting to your meeting location, as well as meeting your Committee in an informal situation, without the pressures of their presentation looming. I strongly recommend that you do not “invite” the presenter to speak that this meeting, even when you mention the topic of the next meeting (you do promote the next meeting don’t you!!! All too many groups don’t which is a shame as it is the perfect time to remind people of the next topic). The reason why you shouldn’t get the future presenter to speak is the focus should be on the person(s) actually giving the presentation(s) this month. One week prior to the presentation, resend a confirmation email to the presenter. The date and time they are due to start presenting, along with a reminder of what time they can start setting up. Also, this is an opportune time to discuss any arrangements for after the meeting. Many User Group Leaders often head out together for a meal or snack after the meeting and it may be appropriate to invite your guest speaker along to that meal. Just a reminder that the auAUG meeting is next Tuesday evening and you are scheduled as the first presenter. I’ve included all the basic information about our meeting again, so you have it all on hand. – MacBook laptop with 2GB RAM running the latest version of Mac OS X 10.6.x Snow Leopard (Although, we recommend that presenters provide their own computer where ever possible). The latest versions of Apple’s iWork ’09 (includes Keynote which also opens PowerPoint presentations) and iLife ’11 are installed. An Apple Remote is also included. After the meeting a few of the AuAUG committee head next door to Papa’s Pizza to share a couple of pizzas and a coffee. You are welcome to join us if you wish, as our guest. It’s very informal and you can make the decision on the night to join us or not. IMPORTANT: This final reminder should ideally be sent between 10am and 12 noon the day before the presentation! This helps prevent it been overlooked in the deluge of email often encountered first thing in the morning, and leaves ample time for things to be chased up if needed. This email should be really simple and the main purpose is to remind the presenter of your direct contact number should there be any last minute emergencies. Also, list a second contact number of someone else within your group the presenter can contact if they can’t get hold of you for what ever reason. Subject: AuAUG looks forward to seeing you tomorrow! We are really looking forward to your presentation tomorrow night. If you need to contact us tomorrow for any reason, my mobile number is 0400 123 456. David Jones, our Secretary, will be at the venue from 6:30pm and can be contacted on 0409 876 543. If you know your presenter has a Personal Assistant, CC them in on all the reminder emails. If the presenter cc’ed other people in on their replies to you, when you reply back, remember to CC these people in… they may be the presenters boss, or personal assistant and thus may need to know the same details about your meeting as the actual presenter. Limit the number of people within your organisation that you include as CCs. Where ever possible you should have a single contact point within your group for the presenter to approach. If you use a generic email address under your club’s own domain (eg present@yourdomain) rather than a personal email address, then you can redirect or gain access to that mailbox if the person changes. That said, keep others within your group informed of the arrangements you have made… either by using a BCC or forward your messages to others within your group that need need to be kept informed. Do not rely on the presenter reading your website for meeting dates, nor venue locations – supply that information directly to them. Be prompt in responding to any queries that the presenter may have. Also, don’t hesitate to ask the presenter any questions you may have. Remember that the presenter is giving up their time to present to your group. 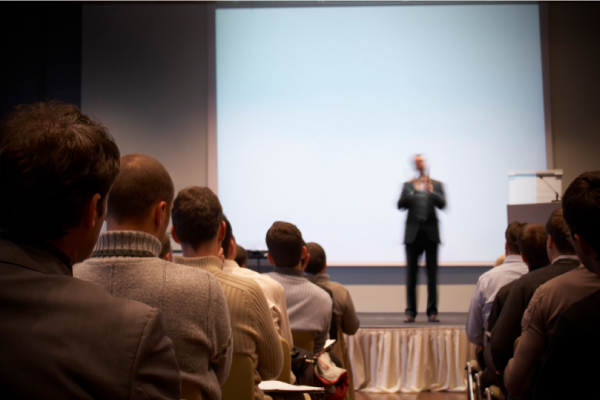 Yes, often you are providing them with an audience to market their products to — but in most cases you have asked them to present to your group, not the other away around! Anything you can do to make the presenters job easier, or make them more confident to present to you group, the better your relationship will be with them.